September 6, 2013 was the launch of Break Time, at Alas Oplas Board Room, with all the Alliance employees. This activity primarily aims to promote camaraderie among the employees, brings out inspiration while adding up information that connects to everyone while enjoying, applauding with a relaxing and stress free environment. The motivational speaker, evangelist and preacher, Mr. Nick Vujicic, with a video clip touches one’s well-being with his inspirational story. Life has never been easy for Mr. Vujicic, by the absence of all four limbs, he realized he was not a unique in his struggles and begun to embrace his lack of limbs. He realized that his accomplishments could inspire others and become grateful for his life. At the age of seventeen, he started his non-profit organization, Life Without Limbs. He presents motivational speeches worldwide, on life with a disability, hope and finding meaning in life. He also speaks about his belief that God can use any willing heart to do his work and that God is enough to overcome any disability. Vujicic currently lives in Los Angeles, California, Unites States. February 12, 2012, he married his fiancée, Kanah Miyahara. This year, February 13, their son Kiyoshi James Vujicic was born, weighing 8 pounds 10 ounces. Surprise had started . . . The company extends greetings to (9) nine of the birthday celebrants of September namely [from left to right] Ms. Lea Chimmin, Ms. Cecile Maglunob, Ms. Aileen Santander, Ms. Cindy Madonero, Ms. Crystal Cordova, Ms. Sofia Rosal, Mr. Abraham Madiwa, (not in photo) Ms. Lyra Mae Alvarez and Mr. Francis Catamio with a simple sweet gift that add smile on their faces. Surprise never stops while the company pays tribute to the most trusted staff by Alas Oplas Top Management for 12 long years and still counting. Her name is one of the most wanted early in the morning most especially to Finance Department and to Ms. Marycris Oplas. 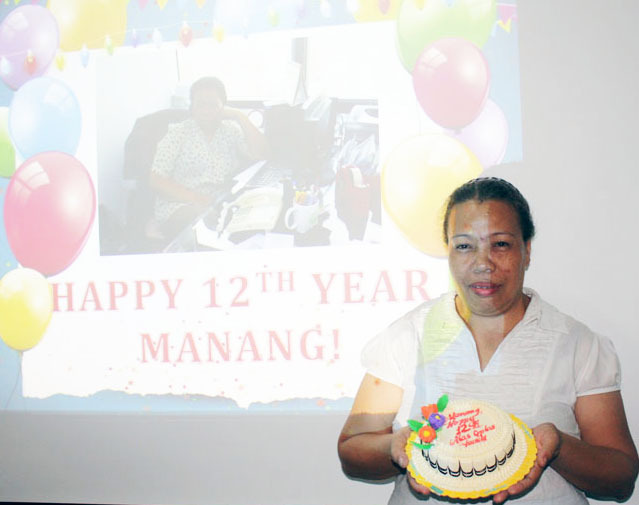 She is popularly called Manang, Ms. Emelita Estrologo, the most loyal employee of the company. Ms. Marycris Oplas, Senior Managing Partner have her speech, she surprises the employees with tons of good news and unexpected revelations with the company’s future plans that will lead us to be more stronger firm thru the help and effort of each and every one. Snack has been prepared for all the attendees. This day has been a successful launch of Break Time, thank you for the initiative of our Human Resources Department, congratulations!